The spindles are made of hardened steel with sapphire thrust bearing at the tip. Coupled with ceramic ball bearing, we would find our TT experiencing lower friction and lower noise level, hence bring about sonic improvement. It's available for order now! sorry, that it took me so long to write this feedback. But your parts arrived when I head just installed my new cartridge. So I had to wait till it was burned in. In the package I found lube oil and ball bearing as well. It was a little surprise because they were not included in the delivery announcement or elsewhere. Although I just recently renewed the bearing oil, I changed it again and the ball bearing too because I thought you would have sent me the best for the performance of your product. Each tuning step brought either a clear sound gain or, in the case of the VTA adjuster, more comfort. 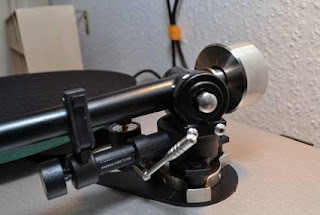 The VTA-Adjuster was very easy to mount: I just needed to file the tonearm hole a little bit and replace the grub screw with a shorter one. The part works quite wonderfully. Your subplatter and the two straps look really good accompanied by the Bfly weight. The installation of the subplatter was, of course, very simple. Operated with the original black Rega strap, I experienced incredible: the background noise decreased significantly. I got smoother heights and more defined basses. The installation of the subplatter was, of course, very simple. 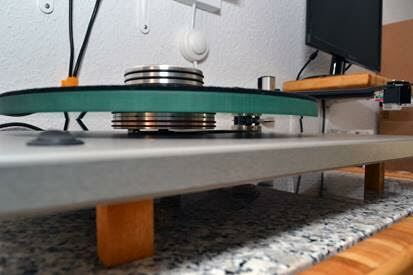 Operated with the original black Rega strap, I experienced incredible: the background noise decreased significantly. I got smoother heights and more defined basses. The detection improved, as did the depth stacking. The overall sound was more coherent. A really great sound improvement! 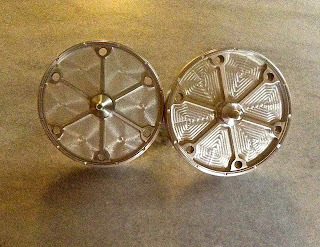 The original Pulley was quickly removed with the pulley puller, the dual pulley installed even faster. More problematic was the installation of the silicone belts, because they jumped down at first over and over again if I got going the engine. With the lower one even the worst case occurred: It landed in the bearing oil. After I had cleaned it, and then some other attempts the belts finally stayed – and I was thrilled again: The sound is a lot more stable. Voices and instruments remain in their places, and are much more precise. The middle range is more present. So I am really happy with the modifications made by your products and have now been addicted. Just by chance, I came looking for a VTA adjuster to your blog and saw for the first time, what possibilities are there to optimize Rega drives. Since then, I have been working on the subject at first. 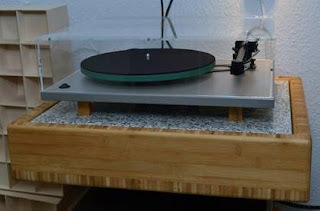 I have an eye on a new (Audiomods) tonearm. But first I feel the need to optimize the running gear with your help. I will send you a separate mail with my initial thoughts and questions on this subject.